It’s time to wrap up the penultimate episode. It’s really sad knowing that Thursday is the official end. Sniffle. Joon congratulates Sangdae on making the right choice, however, Sangdae doesn’t seem so convinced. He’s not happy with betraying Bum Soo hyung, so Joon had better keep his promise and make him a singer. Joon vows to do just that and says that this song will be the last of Sangdae’s time as a songwriter. Joon also promised Go Dong…look how that turned out. Shakes head. WHY do people trust this conniving man? Joon then says that Sangdae’s stage name should be “Wolf.” Meanwhile, Tae Ik and crew arrive at U Entertainment and Tae Ik immediately rushes up to Kang Hwi and grabs his collar. Did his old partner really lack so much confidence that he had to steal someone else’s song? This flummoxes Kang Hwi. What did he steal? Tae Ik lets go and says he has nothing more to say to him and goes to head inside. Kang Hwi stops him and demands to know what happened now. Did Joon do something again? Tae Ik doesn’t answer this and just tells Kang Hwi to ask Joon himself. Kang Hwi leaves and Bum Soo takes the boys home as only hard feelings will erupt if they confront Joon now. Kang Hwi goes to Joon’s office where Joon is smirking over the song. He tells Kang Hwi this will be the song used on the rival stage. Kang Hwi takes the song and sits down. Is this song Tae Ik’s? The other man had just accused him of stealing the song. Is that important? Kang Hwi slams down the song and yells for the truth. Truth? It doesn’t matter. Winning is all that matters. Kang Hwi asserts he doesn’t need such methods to win. Joon says that as long as Kang Hwi is in top condition and no problems arise, then yes, he would win, but Joon’s job is to imagine the worst and do what he can to ensure Kang Hwi’s win. Omo. Joon references the song “The Winner Takes It All.” I’m sorry, I just had to chuckle at Joon’s sudden burst of English. Not sure why. Joon then translates this into Korean and tells Kang Hwi the only way to not be forgotten is to win. Losing will ensure that Kang Hwi will be erased from people’s minds. This just might be his last stage so in order to win and not be forgotten, he must do whatever it takes. It’s now Kang Hwi’s turn to sit on the swing and thing over things. I sincerely hope he goes for his own song and not Joon’s stolen song. Isn’t that better? Anyho, Man Ok goes down to the basement to find Kang Hwi, but it’s empty save for Chaton. She picks up the kitty (LOVE the little angel wing sweater they have the cat in btw) and asks where his daddy is. She then notices an untitled song on the table with the name Han Sang Dae written on it. Of course, Man Ok recognizes the name since she was there when Bum Soo first introduced him to Tae Ik. Man Ok rushes off to ask Bum Soo who doesn’t want to talk about Sangdae’s betrayal. Wolf? He’s a fox instead. So that song? Bum Soo confirms that it was originally Tae Ik’s song and Joon managed to do something to nab it at the last moment. You really can’t trust a single person in this world. Is that why Man Ok wanted to see him? Yes, because she’s worried. Bum Soo apologizes for what he’s about to say and then say he doesn’t want to see anyone related to U Ent at the moment. Even if he understands and knows Man Ok’s character, she’s just another person at U Ent. Besides, Man Ok is one who must stay by Kang Hwi’s side not Tae Ik’s. Even though he knows she worries about Tae Ik, she should make herself clear and stand solely by Kang Hwi since Tae Ik has more support than our blondie. Man Ok says she understands. At the studio, Bum Soo drinks with Go Dong and is irritated by the betrayal. Go Dong tells him not to worry as things will work out. Bum Soo doesn’t know how since there is no song and the show is just around the corner. Bum Soo really feels bad as he took the boys under his wings and now he can’t even have the boys debut. Go Dong says there will be other chances even if they can’t do the rival show. He then says he’ll sing a song for Bum Soo to cheer him up. Before he starts, he complains that Tae Ik is sitting morosely alone in his tent instead of joining their drinking party. That’s just like Tae Ik, though. Brood alone, brood alone. This is where Man Ok would usually come up and bug him, but she’s not by his side right now. Go Dong starts playing the guitar and singing and Tae IK’s ears perk. He recognizes the words to the song in shock. He goes out of his tent and goes to the office where Bum Soo and Go Dong is drinking. Tae Ik demands to know where the song came from since he’s never heard it before. Go Dong says he made it—is it strange? This floors both Bum Soo and Tae Ik. Go Dong really made the song? Bum Soo then throws food at our little manager. Why didn’t he say so earlier the jerk? Poor Go Dong. Why is writing one song so bad that he gets food thrown at him? Tae Ik smiles and tells Bum Soo they should use that song. Bum Soo agrees, but where will they get a lyricist at this time? Go Dong volunteers Tae Ik since he was using Tae Ik’s words to begin with. Another shock for Bum Soo. Tae Ik writes. Tae Ik is about to lunge at Go Dong for peeking at his diary, but Bum Soo stops him. First bring him the diary. They will debut with a perfectly composed self-written song. Tae Ik wishes to use a lyricist, but Bum Soo and Go Dong encourage him to write the lyrics himself. Go Dong says he never knew Tae Ik to be such a romantic and Tae Ik lunges again, but is stopped again by Bum Soo who hugs him. Ahahahaha. Tae Ik HATES being hugged! Go Dong soon joins in with a smile and a plea for Tae Ik to write the lyrics. Bum Soo even promises hefty lyricist fees. This breaks him down and he agrees. Bum Soo and Go Dong bring in recording equipment and instruments. Go Dong works on composition and arrangement while Tae Ik also works on the lyrics. Meanwhile, Jang makes sure to keep training the boys so they can do their best. At Full House, Man Ok hugs a jacket she’s prepping and recalls Bum Soo’s words about only concentrating on Kang Hwi for now. We all know that jacket isn’t for Kang Hwi-nim. A package is delivered to Man Ok Kwan for Tae Ik. Go Dong brings it in and our quartet tries to figure out who knows Tae Ik is at the studio. They don’t know. There is no sender or return address. It only says Take Forever on the box. Open it. They do and inside is a gift box with a note and a letter. The letter wishes Take 2 luck and requests that Tae Ik and Go Dong wear the outfits on their debut stage. Oh, and they are 100% cotton by the way. Tae Ik grabs the letter and sees the polaroid of the cat doll and scooter. He knows who sent the package. Go Dong is in awe of the outfits. They are much better than what Bum Soo had procured for them. Can they really wear them? Yes, since it was a fan who sent them thinking of their success. Tae Ik puts down the picture and then pulls his out. The day of the battle arrives. Fans anxiously wait outside while the competitors meet inside. Joon commends them on not giving up and Tae Ik says that he will show Joon that no dirty or underhanded methods can be used to break him anymore. He then glares at Kang Hwi before moving on. 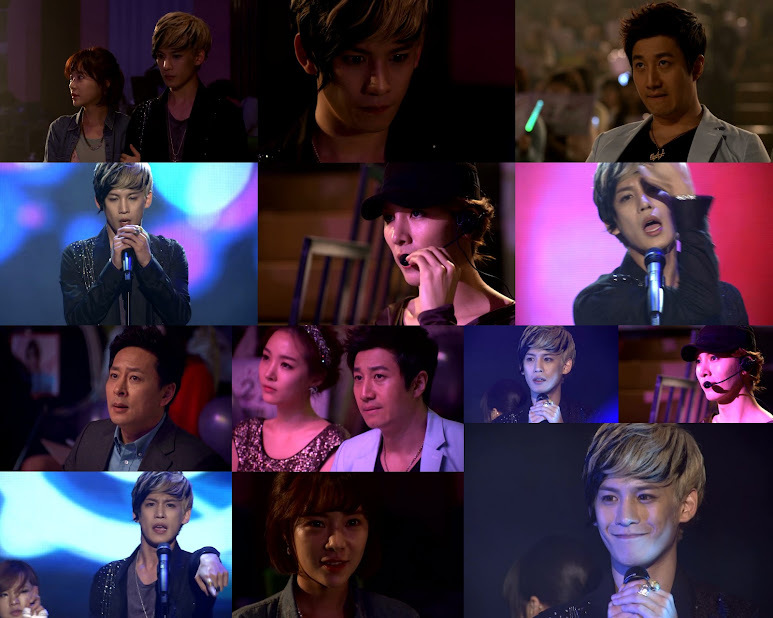 Neither Joon nor Kang Hwi look too happy, but Joon starts laughing at the site of Go Dong wearing eye makeup and takes Kang Hwi with him. Man Ok pauses and looks back at Take 2 with worry on her face before going on to join Kang Hwi. The rivals are introduced. They debuted as Take One in 2007 and eventually split their separate ways this year to become deadly rivals with new names. Who will be the ultimate winner? Kang Hwi is set to go first. Man Ok preps him and says he must be nervous to go first, but he has to remain calm since he is Kang Hwi, the best in the universe. Kang Hwi smiles, but his vision starts blurring. This freaks Man Ok out. Kang Hwi is then told there’s 20 minutes to show time. What to do? He can’t see a single thing. Man Ok starts panicking. Should she call Joon? At this time, Go Dong is prepping when Tae Ik comes out saying he’s going out for some air since he feels stifled. This worries Go Dong. It will be their turn before you know it. Tae Ik tells him not to worry as he only needs five minutes. He walks out to the roof for a breather. He notices Man Ok crouched on the ground crying. What’s wrong? He starts worrying and asking what the problem. Man Ok can only cry and asks what to do. Tae Ik rushes to see Kang Hwi and Man Ok tries to stop him since Kang Hwi wanted to be alone. Tae Ik angrily shakes off her grasp and continues walking. Kang Hwi is trying to calm himself down. He starts begging and crying and then flips over the table. Enter Tae Ik and Man Ok. She rushes over to Kang Hwi who cries and says he can’t see anything. Tae Ik just stands in disbelief. You know he honestly still cares about Kang Hwi despite their differences. Tae Ik lifelessly leaves and recalls Man Ok’s confession on the rooftop about Kang Hwi going blind. He then slides down the wall and starts crying. This doesn’t make sense. Why? Why Kang Hwi? How can such a horrible thing happen? Man Ok is trying to convince Kang Hwi to tell Joon and give up since he can’t possibly perform if he can’t see. Yes, he can. He can do that song he wanted so badly that I believe is not a dance song. Tae Ik then has regrouped and comes in once more. He asks what Kang Hwi is doing. Is he quitting? Kang Hwi asserts that he is not. Why would he? Tae Ik grabs his wrist and puts something in Kang Hwi’s hands. What is it? Tae Ik tells him not to be stubborn. This is the only way for him to be able to get up on stage. This is not a competition between them, this is about keeping a promise to the fans who have gathered and are waiting. Kang Hwi needs to get up there and keep his promise. I love Tae Ik. The program starts and Kang Hwi nervously waits in the wings with Man Ok. Tae IK is across from the stage in a different outfit and hate giving Kang Hwi-nim instructions and stage layout and trying to calm Kang Hwi’s nerves. Awwwww. Tae Ik says he will be in front of the stage watching Kang Hwi. Kang Hwi shakily goes up to the stage, his vision a complete blur. The music starts and Joon looks completely surprised. Yay, Kang Hwi-nim!!!!! It’s sad because you know it’s about his love for Man Ok. Kang Hwi sings of hurting because he loves a girl who has eyes only for someone else. 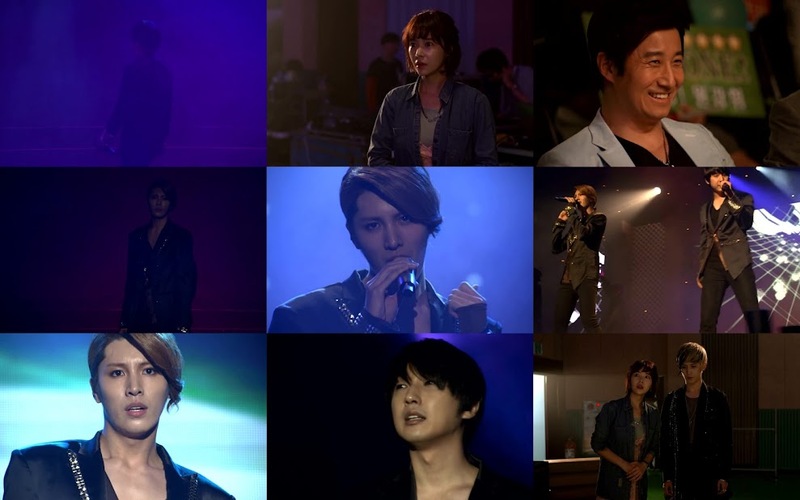 The song ends successfully and Kang Hwi hears Tae Ik telling him that he was awesome and the best. This brings a smile to Kang Hwi’s face. The anxious Go Dong and Bum Soo are behind the stage freaking out since Tae Ik is still not there. Man Ok then comes up and tells them not to worry as Tae Ik will stand on that stage as promised. Bum Soo sends the worried Go Dong first. Joon laughs as Go Dong enters the stage alone. The lights go dark and Tae Ik enters as the song is about to start. Joon’s smile fades. Tae Ik starts singing first and then comes Go Dong’s turn. Joon looks uneasy as the fans seem to react well to the duet. I LOVE both songs. I couldn’t choose a winner. I must say I’m a tad disappointed because Go Dong’s voice is barely heard, and we get such a short snippet, but it was still awesome. With the performances done, all that is left is voting. Joon comes backstage and scolds Kang Hwi for changing the song. Kang Hwi says the original song didn’t suit him. Joon says Kang Hwi will bear full responsibility if things go wrong. He leaves and Kang Hwi nearly collapses. Man Ok is worried since Kang Hwi is really pale and has a fever, but Kang Hwi asserts its just nerves and goes onstage where we end this episode before the final vote count is revealed. 😦 You just want to hug both Kang Hwi and Tae Ik and Go Dong. They did great jobs and all three are suffering. I was half expecting Kang Hwi to collapses before the results. I’m hoping for a tie. Fingers crossed. Although, if this is really Kang Hwi’s last stage, it would be nice if he won by a small margin. Tae Ik’s confrontation with Kang Hwi, it is clear Kang Hwi is clueless. Watching Man Ok hug the jacket was so sad and sweet. The clothes she made for Take 2 are perfect. Tae Ik is the best friend a guy could have, he is truly upset about Kang Hwi’s condition, and puts all thought of competition aside to help his friend give his all on stage. I am going to miss these characters. This has turned out to be a great drama. It really is cute how Tae Ik does genuinely like his fans. And awww at Man Ok’s present! And Man Ok and Tae Ik’s conversation on the phone, it was in last ep but i’m gonna comment on it here. I thought it funny how Tae Ik called Man Ok and got annoyed because she didn’t answer, but then hangs up on her when she tells him good luck. Those two have such an odd relationship. But at least Tae Ik doesn’t seem to believe what Se Ryeong said about Man Ok being with Kang Hwi because he’s a chaebols son. I thought Kang Hwi looked like he was about to collapse before they read the results too. He was wavering on stage, although that’s just due to the blindness. But it did look like he was about to faint or something. I didn’t particularly like either song, although the lyrics were nice enough. For a show that’s about Idols, there’s a surprising lack of actual songs and performances. I thought the preview for the next episode was interesting. Someone is actually yelling at Lee Joon for a change. Oh, and Joon’s English! That made me laugh too. It’s funny because other entertainment related dramas you keep hearing like the same song over and over and over again to the point you want to scream in frustration. The Musical, etc. And in this, while we did get to hear a lot of Take One’s final song together, we surprisingly didn’t have much after that. But I won’t complain. For what the final songs were worth. They did a good job, however, their cutting of the songs…left a WHOLE lot to be desired. I am happily awaiting Joon to be bawled out, although the president above him doesn’t seem all that trustworthy to me, but we shall see, won’t we? Tae Ik and Man Ok do have a very interesting and unique relationship, which I do enjoy. I think since they have virtually no experience (beyond Tae Ik’s encounter with the watermelon snowflake) that’s why they always behave childishly at times. I’m happy that he really didn’t believe Se Ryeong as he did have me worried for a moment.